This year, at the ripe old age of 38, I hosted my first ever Christmas at home. It was nerve-wracking, exhausting, exciting, fulfilling and well, wonderful. 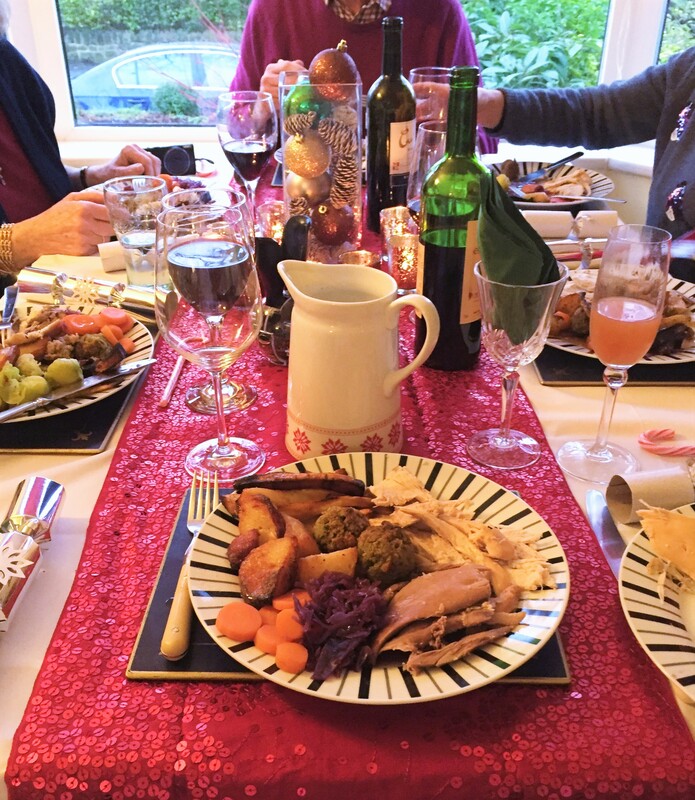 Then on Christmas Day, after a simple breakfast and some stocking opening, they left and both lots of parents arrived – bringing with them many and varied offerings towards the day’s eating and drinking. Only 30 minutes later than originally planned, we all tucked into our roast turkey and trimmings. Plates were cleared, so I take that as a good sign. Although there are several tweaks I will make next year. Those of you who are seasoned Christmas hosts may smile wisely at these and please feel free to add more of your own in the comments! Before you plan your Christmas food extravaganza, make sure you actually have both the fridge and oven space to cope with it all. If, like me, you only have one oven then it makes things trickier – it’s not impossible, but careful planning is required. Thankfully, turkeys can rest for a good hour or two without any harm coming to them so you can do all your potatoes and parsnips etc once the bird is out and relaxing in its foil. Fridge-wise, if you have a garage or shed then make use of these for veggies etc. Those of you with any outdoor space can fill a bucket or crate with water and leave it outside with all of your drinks. Oh, and before you buy your ridiculously expensive turkey, for goodness sake, make sure it’ll fit in your oven! Just sayin’..
Of all the Christmas feast and festivities, there is very little that cannot be at least partly prepared beforehand. Puddings and cakes – obvs. Perhaps less obvs, prepare all your veg the day before. Potatoes need to sit in water once peeled and chopped, then just pour out and give fresh water when you’re ready to par-boil. Carrots, parsnips and sprouts (or most other veg) can be peeled, chopped and stored in freezer bags in the fridge quite happily for a day or two. Check your recipes and where possible, make what you can in advance! Throughout the whole process, I found myself constantly questioning whether there would be enough food to satisfy my guests. Would the turkey be big enough (despite the fact that I’d purposefully ordered one that would serve 2 more people than were actually coming). How many potatoes to do? How many parsnips? The fact is, with so many different things on offer, people tend to have smaller portions of everything and chances are, you’ve done more than enough! I come from a family of drinkers. I’m not saying we’re booze hounds but we like our wine…and our gin…oooh, and a spot of port…and Champagne for goodness sake, it’s Christmas after all. With that in mind, I was sure to get in plenty of supplies to see us through. Chances are though, there will be at least someone who won’t be partaking, be it due to driving, pregnancy or infancy. These poor folk shouldn’t feel that they’re being left out of the frivolities so make sure there’s something special for them too. This year, I did a combination of 1 part orange juice, 1 part apple and 1 part cranberry in a large jug with plenty of ice. It went down very well with children and drivers alike! It may be that you and yours aren’t big drinkers and so the non-alcoholic choice is plentiful. If that’s the case – then you should reverse this and remember to provide for your more boozy buddies! I’m not at all creative or arty but I really wanted people to arrive and feel surrounded by festive spirit and cheer. Short of plying them all with sherry at the door, I was a little stumped. 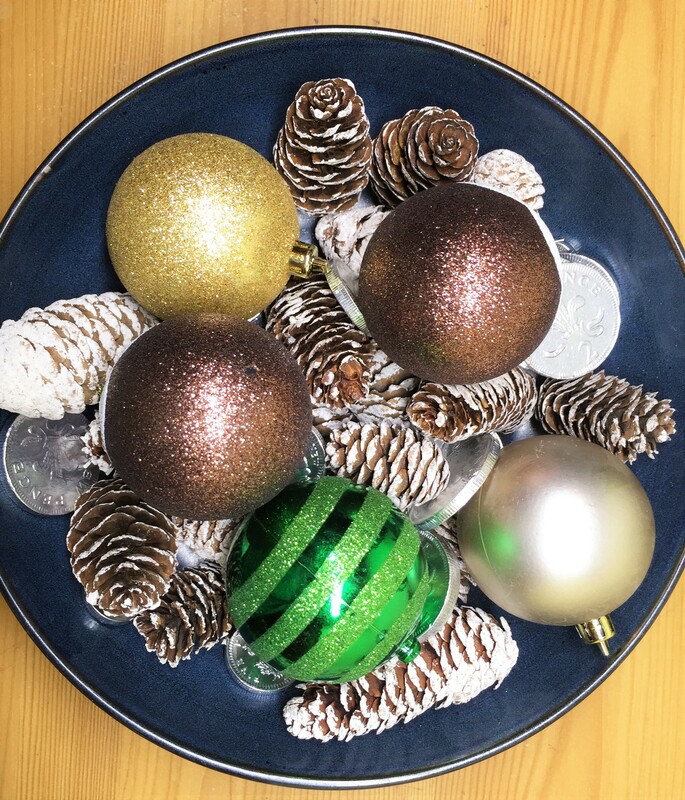 It turns out that it really isn’t too tricky (or expensive) to create a spot of festive sparkle. 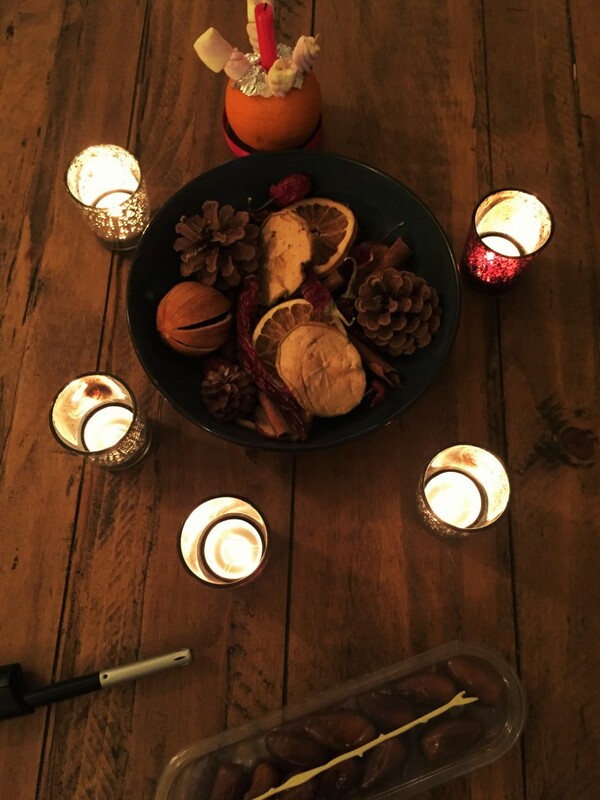 A few fir cones, a bunch of baubles and a whole table (well not quite) of tea lights and suddenly your home is like a little corner of pure Christmas. It’s a bit of a pain to do – you need to work out all of the timings for all of the things you need to prepare. I mean everything. When do you need to pre-heat the oven? When does the water go on for the veg? When do you heat the fat for the potatoes? Once it’s done though you’ll feel calmer and more relaxed – and if you’re calm and relaxed then your Christmas guests will be too. Oh, and keep it for the following year! It’ll make life easier when you’re doing your next timetable. 7) Forget the stupid timetable! Huh? Ok, so I don’t mean completely forget it, but DO allow yourself to be flexible. The chances are that something will happen to throw the timetable out slightly. Don’t let this ruffle you. The timetable is there to put YOU in control, not to control you. If a few tweaks are needed along the way, then go with it – show that timetable who’s boss! If you’re anything like me then it will be easy to turn into a bit of a control freak. You’ve done your planning, you’ve got your timetable and everything is under control goddamit! The only thing is, there are probably a few people there who would actually quite enjoy being involved, getting stuck in and well, helping you. Don’t see this as showing weakness or failure. Christmas is very much a team event. Let people help, get everyone involved and share the fun! Equally, people don’t like to turn up empty handed so if they ask you what they can bring – don’t say ‘oh nothing!’. Christmas is pretty pricey and frankly, any offerings should be gratefully accepted. Your guests will feel happier that they’ve been able to contribute and your bank balance will definitely thank you. I hate to break this to you but something will go wrong. It may be a whopper, like forgetting to buy the turkey, or it may be something so small that no one will even notice. Whichever it is, don’t let it ruin the day. If something doesn’t go according to plan, then change the plan, have a laugh about it and get on with enjoying your day. It’s not about the perfection of the meal, or the beauty of the decorations. It’s about you and your loved ones being together and sharing Christmas. Who wants to be scrubbing greasy toasting tins on Christmas Day? Add 1 sugar cube and a couple of drops of Angostura Bitters. Cover the sugar with brandy, add a slice of orange and then top up with Champagne (or any other fizz that you have to hand). 12) Enjoy yourself – it’s Christmas! Hopefully, you’ll have spotted this as a general theme throughout. It can be so easy to get completely caught up in the plan and in the moment, that suddenly the day ends and you realise that you didn’t speak to your loved ones apart from in barked orders or sharp retorts. So fraught were you, that you didn’t notice your children as they frolicked with their wrapping paper. So tense were you that you completely missed the hilarity when Dad fell asleep and his paper hat fell on to his face.